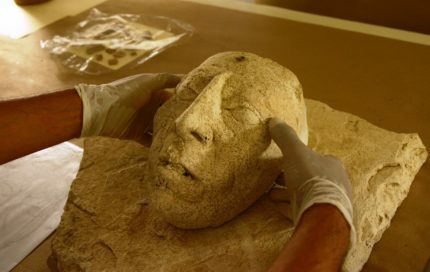 Archaeologists have discovered a stucco mask believed to depict Maya ruler Pakal the Great at the ancient site of Palenque in southern Mexico. It is a human visage, not a fantastical creature or deity. The face are those of an older man and there are no previously known images of Pakal as a senior, the features — in particular his prominent mouth — do map to depictions of the Lord of Palenque like his glorious jade mosaic funerary mask now in the National Museum of Anthropology in Mexico City. 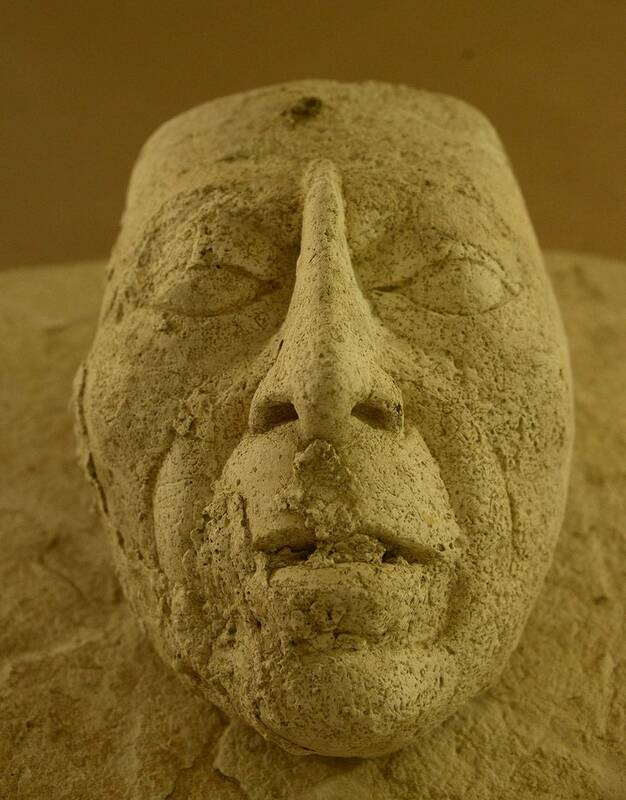 The apparent advanced age of the face in in the mask is itself evidence in favor of it being Pakal. Pakal ascended the throne in 603 A.D. at the age of 12 and reigned until his death 68 years later. His is the longest known reign in the Western hemisphere and the 30th longest in the world. Under his stable rule, the city-state of Palenque reached its political, military, cultural and architectural zenith. Experts from Mexico’s National Institute of Anthropology and History (INAH) discovered the mask during restoration work in House E of Palenque’s Palace complex. Work began in January to contain and restore damage caused by weather and wildlife in Houses A, B, C, D and E. At House E, the team was addressing the accumulation of water in the east courtyard which during the rainy season filtered into the building and caused persistent moisture problems. To seek out the source of the moisture infiltration, archaeologists dug under the exterior surface, a level equivalent to the bay of the building where the water was seeping in and damaging the stucco, wall paintings and characteristic ornamentation. They unearthed the remains of what is believed to have been a pond. Just behind it is where the mask was discovered. Accompanying the mask were a large number of ritual offerings including ceramic figurines, vessels, jadeite pieces, napped flint, nacre shell, obsidian, cinnabar, pyrite, two pearls and a plethora of animal bones from fish, turtles, lizards, crabs, birds and snails. The offerings symbolize water and fertility. Many of these were imported luxury items, an indication of the high status of the individual represented and of the general prosperity of Palenque society. “The offerings are usually presented when there is an end of a period, an architectural renovation or the construction of a new building. In this case, it looks like it was a renovation,” said González. Elsewhere, [in House C] the researchers identified a nose-ring made of bone that although it does not belong to Pakal does coincide with its Late Classic period [(684-720 A.D.)]. 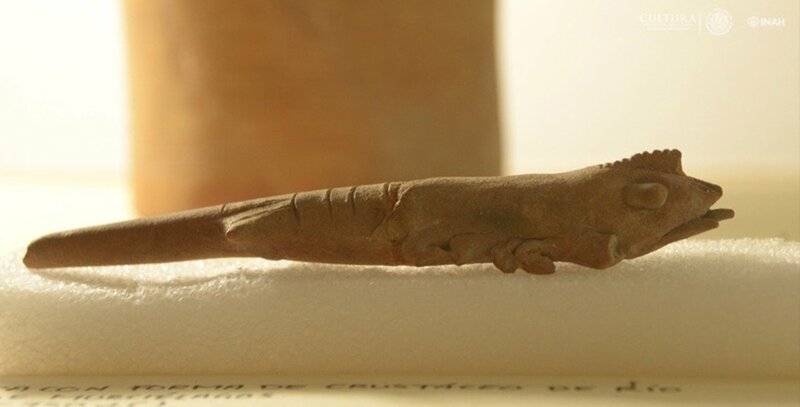 “I do not know a naringuera of this type neither in Mayan area, nor in Mesoamérica; it’s unique,” said González. The conservation of House E is going forward now with the construction of a new water drain that should alleviate the problem of moisture retention. 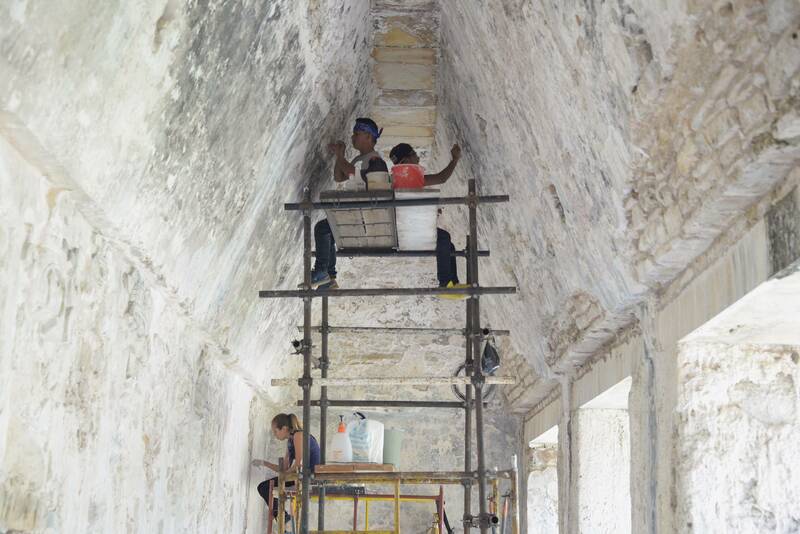 The cleaning of the walls, which have seen significant microorganism growth as a result of the water problem, continues. 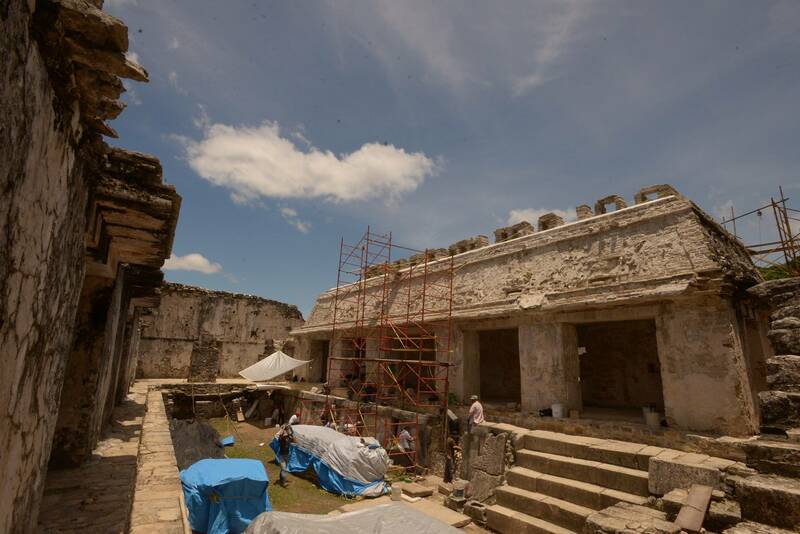 The building is famed for its murals, considering the finest examples in Palenque, so restorers are focusing on removing microorganisms and concretions to conserve and protect the important murals. Palenque is one of Mexico’s most popular archaeological sites. It gets 1,300,000 visitors a year, and that number is increasing.